KATHMANDU, March 27: In an intensified search and arrest operation against leaders and cadres of the Netra Bikram Chand-led Communist Party of Nepal (CPN), Nepal Police arrested as many as 20 of them on Tuesday. With this, police have arrested 81 leaders and cadres of the outfit since the government restricted its activities on March 12. Prior to the restriction, 111 of them had been arrested . On Tuesday, district police offices (DPOs) across the country ran separate operations coordinated by police headquarters to nab various leaders and cadres of the party. According to police headquarters, three of them were arrested from Myagdi, four from Achham, three from Saptari, three from Tanahun, two from Chitwan and one each from Nawalparasi, Sankhuwasawa, Ilam, Kaski and Sunsari. The major arrest of the day was that of district chief of the Chand outfit's people's government Jagendra Bahadur Pun and two other district-level leaders. They were arrested by Myagdi DPO. According to the DPO, the three were wanted in connection with the recent bombing of an Ncell tower in the district. Officials at police headquarters said that all those who landed in the police net on Tuesday were district level leaders. According to police spokesperson, Senior Superintendent of Police (SSP) Uttam Raj Subedi, they have been targeting central leaders of the party. “However, we only netted district level leaders on Tuesday,” he said. According to security experts, the rapid uptick in arrests is the result of the intelligence-based approach taken by police headquarters. “The police have run a special intelligence operation targeting the Chand outfit, which has paid off,” former additional inspector general Navaraj Dhakal told Republica. 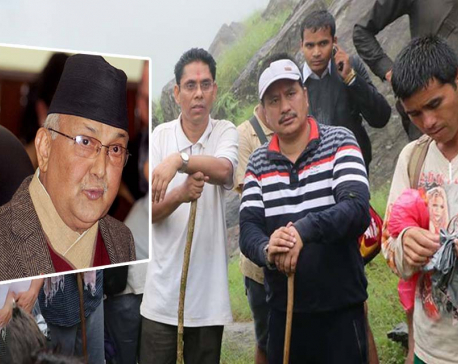 Nepal Police recently formed a special task force under AIG Pushkar Karki to monitor the activities of the Chand outfit and build an intelligence network to track down its underground leaders . The Armed Police Force and the National Investigation Department are involved in the task force. They are also out to seize the weapons the group is believed to have possessed since the time of the Maoist armed insurgency, senior officials said. Former AIG Dhakal underlined the need for such operations . “The government has thereby boosted police morale ,” he said. On Friday, a team deployed from the Metropolitan Police Crime Division arrested Hemanata Prakash Oli, mid-central command leader of the Chand outfit, and four commanders . Meanwhile, there has been speculation about police intentions as none of the bodies concerned in the police organization took responsibility for the arrests. Questions have been raised whether or not police have been bringing those arrested to court. The Maoist splinter group has been involved lately in various illegal activities including extortions and bombings in various parts of the country.